After chicken pox rendered Cate, our daughter, unable to walk last week, we set out this week in the hope that we would be able to put in seven miles or so, involving a loop around Allhallows-on-Sea, followed by the first few miles of a rather tedious stretch of road to get us into Grain. My aunt, Jenny, joined us, together with my brother Alex and Poppy, his daughter. Alas, we misjudged Cate’s state of recovery, and had to abandon our walk after the Allhallows loop. Still, we got a few miles out of the way, and had an interesting time meeting cows and horses, some of whom were pleased to see us, and some of whom were not. While most of the South East of England basked in full sun and warm Spring temperatures, the Hoo Peninsula decided to stay misty and cold. Our walk started back at Allhallows Leisure Park, through which we had to walk to get back to the banks of the Thames. Here, in temperatures of 5 degrees, we found holidaymakers determinedly wearing t-shirts and shorts. We passed the fishing lake where nobody seemed to be catching anything, and reached the embankment to continue our coastal path. The wind was blowing; once we were up on the crest of the embankment gloves and jackets came out. For once, we were all looking forward to getting off the embankment again so we could get some shelter. This was to come in a little over a mile’s time, as once we reached the Yantlet Creek the path turned inland again. It is not possible to cross the creek and so get to the Isle of Grain on the other side, as the land there is owned by the Ministry of Defence. It is labelled a “Danger Area” on the Ordnance Survey map, indicating a firing range or something as equally life threatening. 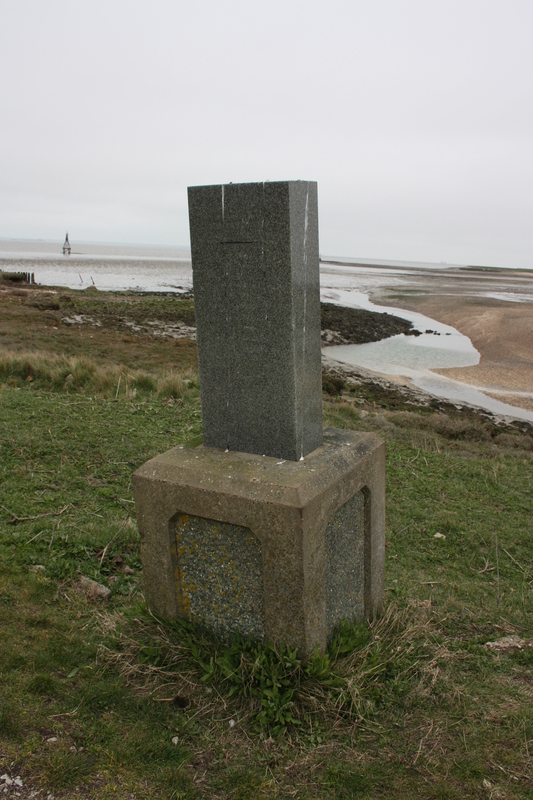 The only option for coastal walkers, therefore, is to loop back inland to Allhallows. There is then a plod for several miles along the only road leading into Grain in order to access the small piece of coast available there. 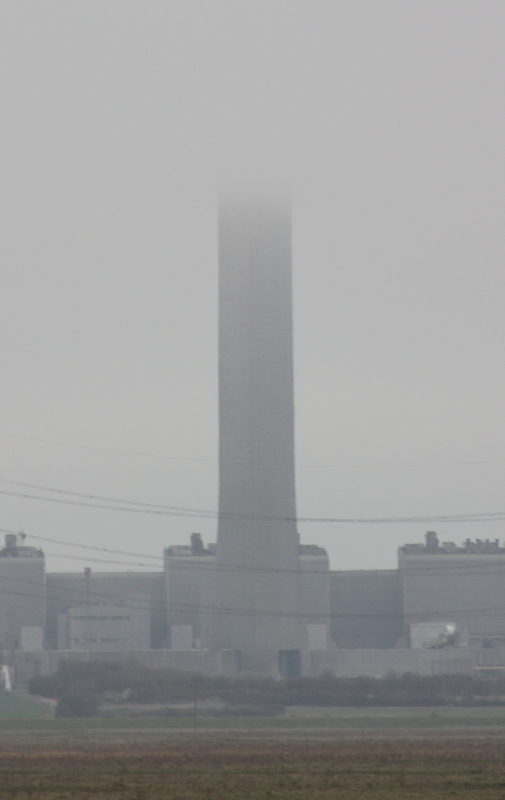 As we walked and wondered if the low cloud would burn off (it didn’t), we saw Grain Power Station in the distance, its domineering chimney stretching up and becoming lost in the cloud. 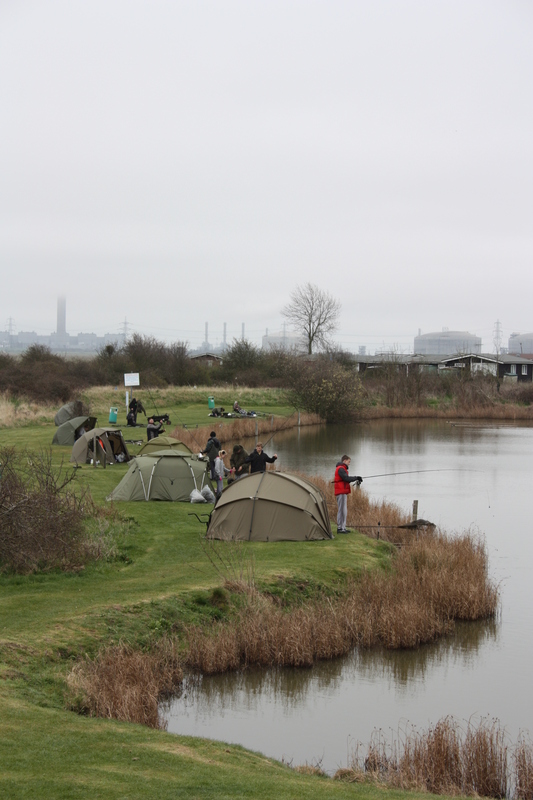 The embankment was borded by the estuary on one side and a river running around Allhallow Marshes on the other. To the other side of this river was a herd of cattle, however, one had become separated somehow, and was on our side of the water. Was this a bull or a cow? Not being very well experienced in sexing cattle, some discussion between our party members ensued. 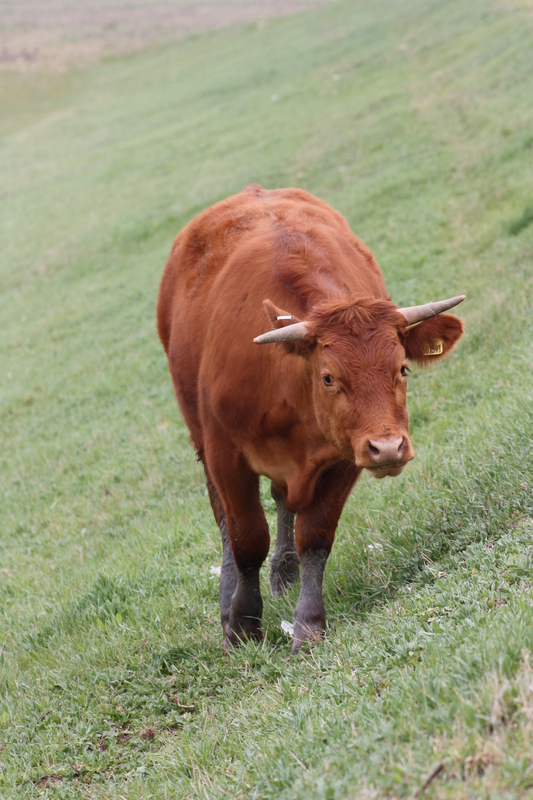 It had horns, though this meant nothing – both cows and bulls can have horns. I couldn’t see any udders, yet to be fair I couldn’t see any thing bull-like either. It wasn’t a huge animal and I was pretty sure it was a cow and not a bull, but what did I know? We decided to be wary. Several of us had been chased by cows in the past; it can be an intimidating and scary experience. As we approached, the cow walked half way up the embankment, equally wary of us, but refusing to yield ground. It continued to graze, keeping an eye on us all the time. We walked slowly and silently, aiming to bypass the animal in our most unthreatening manner. All of a sudden, my niece started running over to it, shouting a very merry “Hello Mr Cow!”. My brother caught her just in time, for she was meaning to skip right up to it and give it a big stroke, something I felt sure it would not appreciate. The cow had lifted its head up at this noise, and seemed to stand ready, although what for we did not want to find out. We continued our slow and meaningful walk, as the cow watched us pass. A few paces later, it went back to its grazing. Clear of danger, we walked on east, eventually reaching the mouth of the Yantlet Creek. On the eastern side of the creek is the London Stone, an obelisk marking the eastern boundary of the Port of London’s jurisdiction over the River Thames. 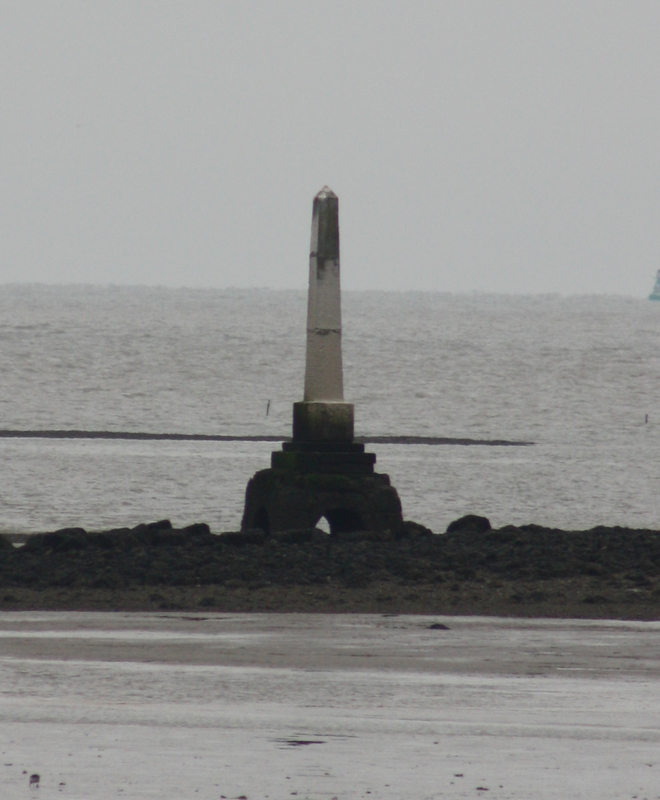 It’s twin, the Crowstone, lies on the other side of the Thames at Chalkwell; we had passed it several months earlier. This wasn’t the only monument we came across; slightly further on was a stout commemorative stone marking the completion of the Thames Flood Defences in the 1950’s. We followed the creek as it ran south and then turned east. The river to our right traced a parallel path, but soon enough there was a bridging point. This was where we had to leave the creek and begin our journey back inland, heading away from the grey structures of Grain’s industrial areas. 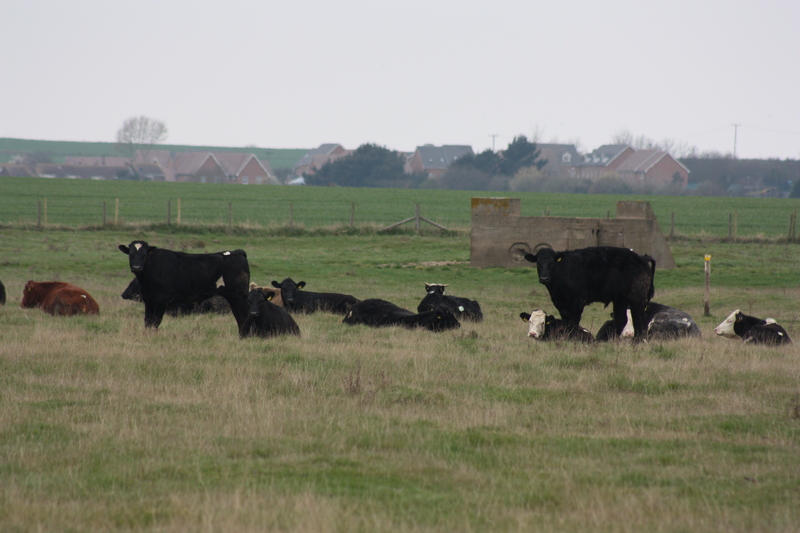 The path took us over Allhallows Marshes, and towards a herd of cattle which had decided to settle down bang in the middle of our path. Beyond them we saw the stile which gave access through the fields and buildings of Binney Farm. I realised we would have to skirt round the cattle and make a circular route over to the stile, but as we approached, one of them spotted us and stood up. We slowed down and started to veer off the path to avoid them. Another one stood up, followed by a third. We walked further south, away from the path. More and more cattle stood up, and the first one started to walk slowly towards us. Eventually the whole herd was up and following, and the first one broke into a trot. I had experienced this sort of thing before. In that case the cow had trotted right up to me, stopping about five foot away, snorting and advancing one threatening step at a time before snorting some more and shooing me out of its field. This time, the cow stopped trotting and kept a respectful distance away, but it was quite clear that the intention was to move us on. We obliged. Once we had veered away south by enough, the cows decided that they were safe, and wandered back north. This allowed us to slowly come back round, making sure we kept our distance, and reach the stile. We were over, and safe. My son described the experience as “interesting”. 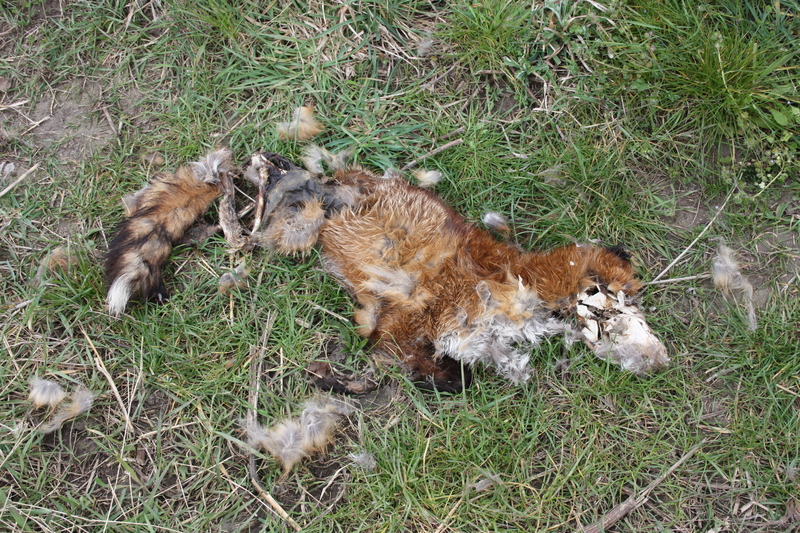 The next part of the walk took us through Binney Farm, where we found a dead fox close to the farm buildings. It had been dead for sometime, and its skull had been crushed. I supposed that the farmer had seen it and shot it. Having lost more than enough of my chickens at home to foxes, I felt little sympathy. Once through the farm buildings, a track led us out to Binney Road, St David’s Road and back into Allhallows. We met a group of extremely friendly horses and ponies on the way who were no doubt on the lookout for some food, but we had to get on. 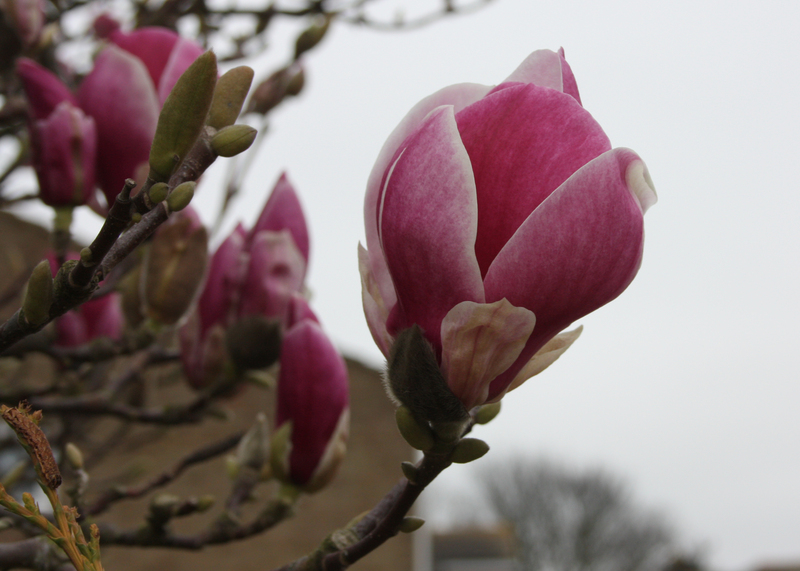 The roads led through a housing estate where a few magnolia trees were just coming into flower. It was a quick walk back to the car. Poor old Cate was in no state to carry on; we would have to save the unappealing road walk for next time. This entry was posted in Kent and tagged Allhallows, coast, Hoo Peninsula, Kent, travel, walking. Bookmark the permalink. I feel terrible about ruining the nudist-beach joke, sorry about that. But you certainly got your revenge by ruining my sunday. Cant wait to do it again! (Seriously, despite the wind and cold and crying I’m glad we came, we enjoyed it on some level, and are certainly keen to do another leg soon as possible). Alex we were delighted you could make it! The crying would have been a lot worse if Poppy had managed to reach that cow I think…!! !